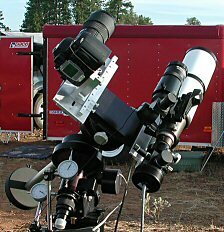 Nikon D70 digital SLR with a 180mmED lens on a Losmandy G-11 mount at the Oregon Star Party 2004. 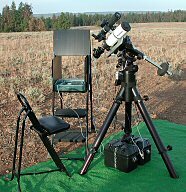 Mounted next to the Nikon D70 is an Orion ShortTube 80 mm aperture rich-field refractor (f/5 focal ratio, 400 mm focal length) which is used as a guider with the Santa Barbara Instrument Group (SBIG) ST-4 CCD camera. The Nikon D70 is mounted with North at the top in landscape format when imaging to the East. 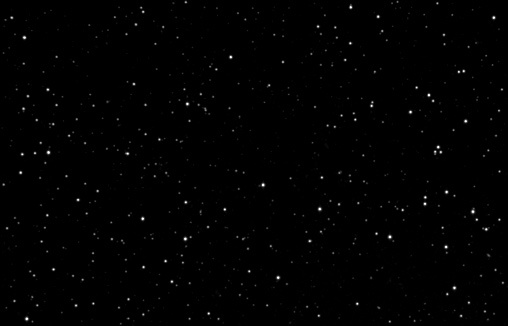 North is at the bottom of the image when imaging West. 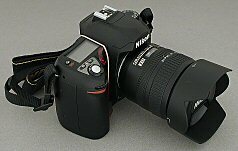 A Nikon ML-L3 IR remote control is used to control the shutter. Nikon D70 Digital SLR Camera has image resolution of 3008 x 2000 with removeable lens. The introduction D70 kit included a 18-70mm zoom lens. Images taken with the D70 with Nikkor 18-70mm zoom lens. Images taken with the D70 with Nikkor 50mm f/1.2 lens. Images taken with the D70 with Nikkor 105mm 1:1.8 AIS lens. Images taken with the D70 with Nikkor 300mm 1:4.5 AIS lens.